Love Carrot Cake? 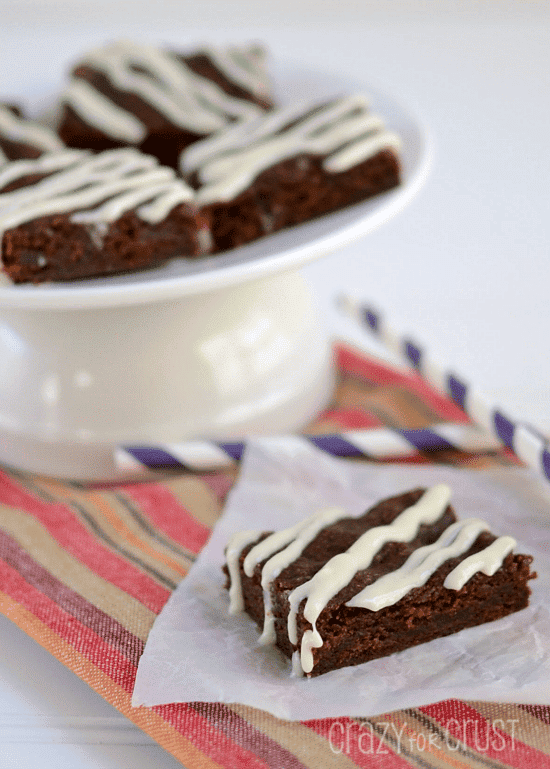 Then you’ll love these Carrot Cake Brownies! Chocolate meets spice in this delicious fudgy Springtime treat! Seriously, I’m not kidding. Or exaggerating. But I know his weakness. His one, single, solitary weakness: Carrot Cake. If I make carrot cake he has to have some. It’s a compulsion. Like I am when I make…well when I make anything. I like making carrot cake into things. So he has to try them. I’ve made cinnamon rolls. And cake pops. And pie. And now? Now I’ve really gone and done it. I’ve made Carrot Cake Brownies. Oh yes, I did. And they are! Really, really good! I took my zucchini brownies (the same ones I used as a base for the vegan brownies) and turned them into Spring’s newest favorite chocolate treat. 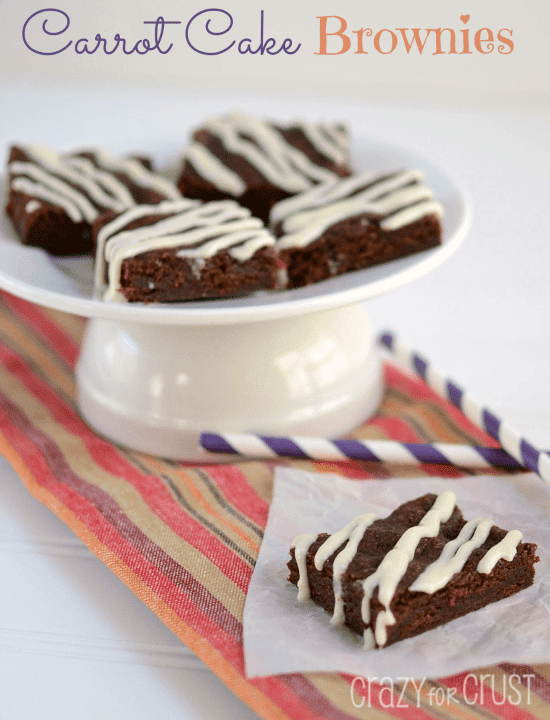 It’s a rich chocolate brownie that is infused with the spice flavors of carrot cake: cinnamon and ground ginger. And carrots, of course. Don’t be scared of the carrots in the brownies, really. They aren’t overwhelming. Think of a carrot cake – is all you taste the carrots? 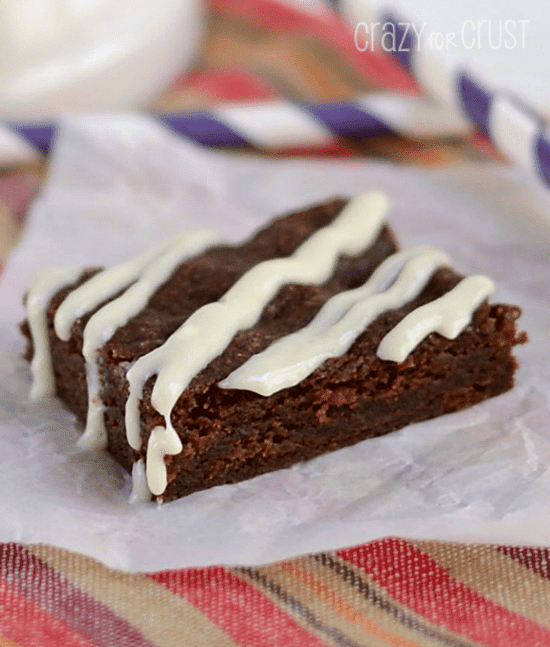 The carrots in these brownies really give a little texture and a hint of carrot cake flavor. The cinnamon and ground ginger really go the extra mile. It’s like magic being paired with the chocolate. And, well. Carrot cake and cream cheese frosting are, like, married. So, as amazing as these were plain, I decided to give some of them a cream cheese drizzle. I was too lazy to make a full cream cheese frosting, so this glaze was perfect. With or without it though, these are some of my favorite brownies ever. Seriously! And, like, my husband loved them. That’s endorsement enough! 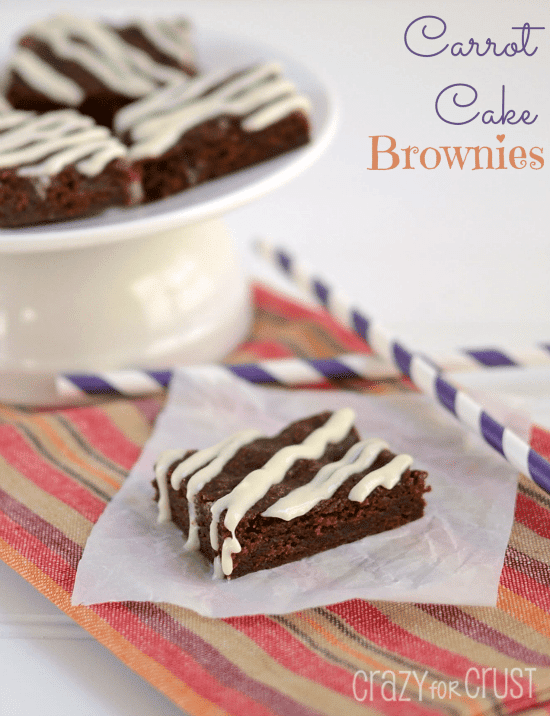 Fudgy brownies filled with the flavors of carrot cake! Stir together oil, sugar, and egg. Stir in vanilla, cocoa, cinnamon, salt and ground ginger. Slowly stir in flour. Pour into prepared pan and bake 25-28 minutes. Cool before frosting. To make frosting: Whisk cream cheese and powdered sugar. (If your cream cheese is too hard to whisk, you can use a hand mixer.) Add milk and vanilla. Drizzle over brownies. Note: glaze will not harden much, so don't stack them! 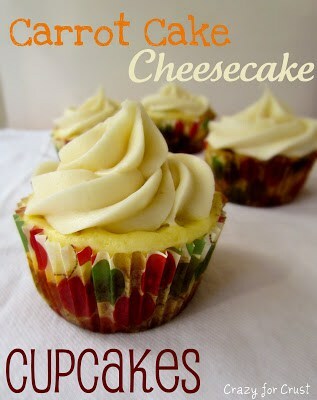 If you love Carrot Cake treats, you should head on over to Something Swanky today. Turns out, she was posting carrot cake goodies tonight too! 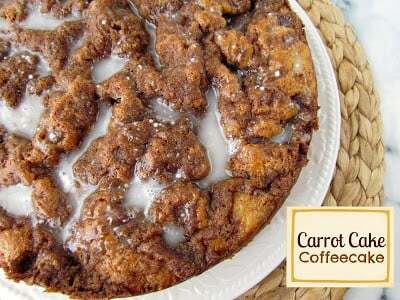 Head on over and check out her Carrot Cake Poke Cake. In true Ashton form, it’s fabulous! I made this last night for my mom birthday, because she loves the texture of brownies and the taste of carrot cake. But these turned out awful. They’re pretty dense, and they don’t really taste like either brownies or carrot cake. I was really excited because you said your husband loved it so much, but no one in my family wants to eat it. I’m sorry you didn’t like them Bri! I got a hint of spice with the chocolate brownie. They are very dense and fudgy…that’s how we love our brownies. I’d love to troubleshoot with you. Did you make any substitutions or changes? Were your carrots on the wet side or dry side? Its weird i made the brownies and i said they have carrots in them so nobody ate them?!! Well, if they tasted good, they missed out! I’ve made these twice and both times were moist and really tasty. I added chopped pecans and they were predictably delicious. The second time I did add a couple tablespoons of water because the batter was a bit thick. And I used coconut oil which I love and use in all my cooking and baking.